If you’ve read some of my previous fashion posts, you know I’m a sale shopper. I will stare at an item for months waiting for the price to drop low enough for me to justify spending money on it! So here are a few items I’ve got my eye on right now! Clothes are hit or miss from Old Navy when it comes to the fit and size. When a bunch of items I like start showing up online, I’ll pop into the store and figure out what I do and don’t like and what size I am for the clothes I do like! I did just that with these items! 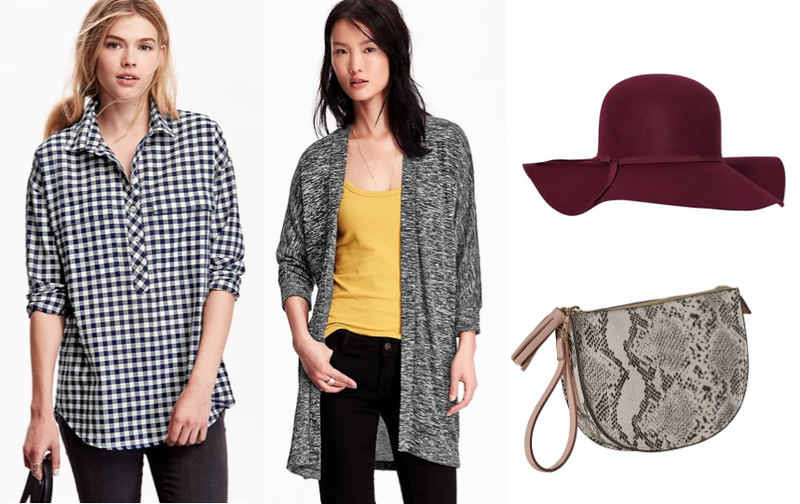 Long cardigans are going to be everywhere this fall and this dark grey one is so perfect. It’s very light so definitely not going to keep you warm in the cold but it is a great transition piece as we move into Fall! The gingham pullover is sooo comfortable. It’s a boyfriend (aka baggy/loose) fit so if you’re like me and don’t want to be wearing a sack I recommend going a size down! The snakeskin clutch is another great item because it can act as a neutral but still be fun and the tassel detail is too cute! And that hat. Do I really need to explain? 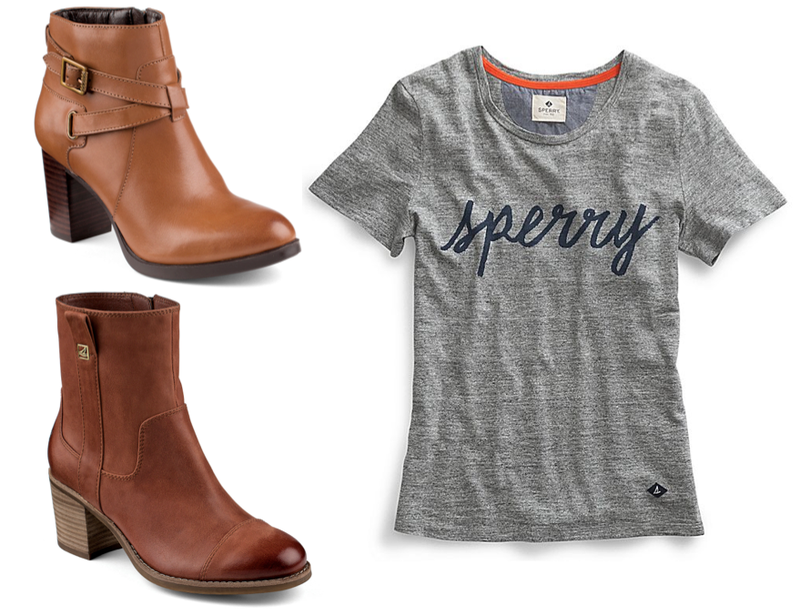 Okay this past spring I was in the Sperry Outlet eyeing these gorgeous brown booties. I kid you not, I almost cried when they didn’t have them in my size. I’ve been hunting for a similar pair since then with no luck! After checking their site, I’m so happy that they are back (or atleast VERY similar ones are back) and you bet your bottom dollar I will be obsessively watching out for a sale online or at the outlet! The Dasher Belle bootie (top) is a gorgeous color but the Helena Pull-On Bootie (bottom) is on sale right now for $99 so I’ll be thinking about that as a back up in the mean time! Back when I started college, I had waaaaay too many t-shirts and not enough casual nice blouses. Now, I’m finding I have the exact opposite problem, so a few cute new t-shirts are at the top of my list of things to buy! This sperry t-shirt will be a great addition to my closet! Last winter, I got a past the knee length winter coat and I absolutely loved it. The problem with one, commuting and two, wearing scrubs, is that when it rains you will get soaked. So, I’ve been looking for a great raincoat that comes atleast to the knee because nothing is worse than your pants being soaked through. I love this one for the hood and the length and the fact that it’s mesh-lined which makes it great for those steamy summer storms. So I probably won’t wait for this to go on sale but I just haven’t gotten around to buying it. I had seen this floral keyboard on a blogger’s instagram (I really cannot recall who) but when I saw it, I just had to have it. There are not many things I love more than the color pink and flowers so this keyboard cover is absolute perfection! Plus, it’s only $8.90! So that’s all the items I’ve got on my watchlist right now. I can’t wait to see what comes out as more companies start releasing their fall lines which seems crazy right now in this hot and humid weather. PS. Make sure you sign up to recieve emails from your favorite stores because while it is annoying to have to delete emails everyday from them, every so often you’ll find something you love and be able to buy it on sale! Stores are big on having one day only sales so this is really my go-to to learn about them!